TMJ pain, or temporomandibular joint pain, is defined as discomfort, soreness or aches in either the upper or lower jaw, in the cheek muscles, or in front of the ear where the two jaws join. Jaw pain can be caused by a variety of factors, including bruxism (clenching and grinding), tooth infection or trauma to the facial muscles. 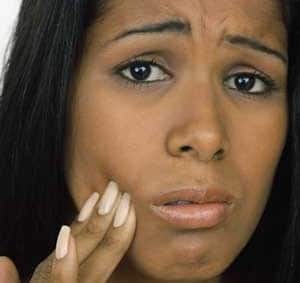 What are the symptoms of jaw pain? Jaw pain may be accompanied by shooting pain in the jaws or teeth, headache, earache, neck pain, or muscle soreness. Untreated jaw pain due to bruxism may result in premature wear and tear on the teeth. What can I do until I see a dentist? To relieve the pain, you can take an anti-inflammatory such as Advil, unless you are allergic. Avoid chewing on the affected side. If you’ve been given a splint or a nightguard, wear it. What will the dentist do? The dentist must determine the reason for the jaw pain before recommending a course of action. A thorough examination that includes x-rays can help determine the cause. Need an emergency dentist in Toronto? Adelaide Dental is a general and emergency dental clinic in downtown Toronto. If you have a dental emergency, call or email to make an appointment.